also they had a 4670k @ 6.2ghz at 1.2ish volts. heres the valdation. i ... might have to dump my ivy bridge (which is amazing dont get me wrong). for this. I really doubt this is real. Haswell uses the same manufacturing process as ivy bridge and will generate more heat at the same clock rate. I'm curious as to why parts of the pic are blurred. I can understand if the user doesn't want any backlash (which blurring would do anyway, and you don't *have* to care about the internet's opinion) but validation usually means vetting something completely. We can't really verify that the results are in fact in the database without an ID. (05-03-2013, 04:59 AM)NaturalViolence Wrote: Haswell uses the same manufacturing process as ivy bridge and will generate more heat at the same clock rate. It won't matter. 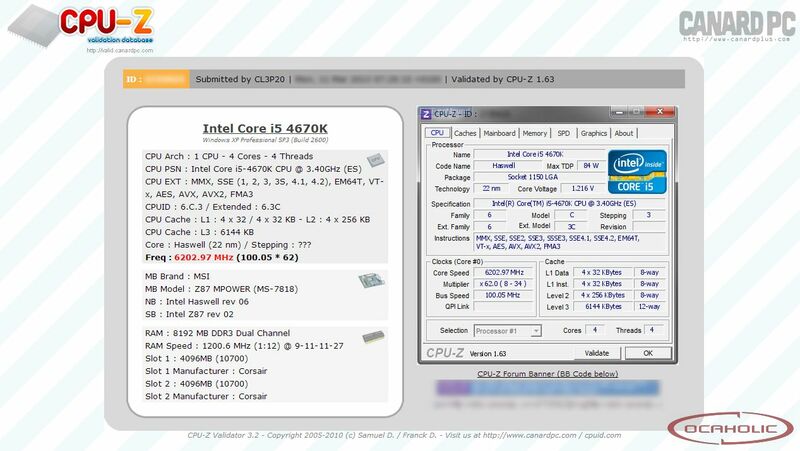 You can't get a delided ivy bridge to run anywhere close to 6.2GHz at 1.216v. And haswell has a wider pipeline so it should require more voltage to remain stable. LN2 won't help it stay stable with such a low voltage. Congratulations, this thread is the first result when Googling valdation. (05-04-2013, 07:14 PM)lamedude Wrote: Congratulations, this thread is the first result when Googling valdation.